I was looking forward to attending all the three days of Bangalore Literature Festival held from 27th to 29th September 2013, but could make it only on the concluding day. Still it was a wonderful experience. It was reported that there were many sessions of panel discussions by fabulous collection of authors, book launches, workshops, quizzes for children and classical music performances. When I came to know on the 29th Sept that the venue was shifted to Electronic city I regretted for not able to attend the first two days, and was very eager to attend at least the concluding day. It was held at Crown Plaza, Velankanni Park. An interesting conversation session of the legendary poet Gulzaar with Bhavana Somaya, film critic and author was going on. 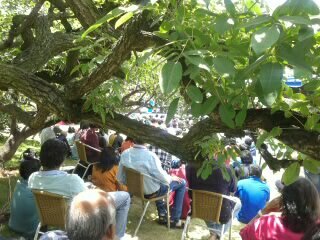 I was amazed to see the pleasing green venue packed with audience, notwithstanding the scorching sun, eagerly listening to the lively conversation. The chairs provided were full and those who were not lucky to get a chair, were happily sitting on the open ground, some of them had managed to get some shade under the sprawling trees. Stills from some of the old charm Hindi films were shown where lyrics were written by Gulzaar, which was very nostalgic. The conversation between Bhavana Somaya and the legendary poet with his quick wit and polished sense of humour, was very inspiring. After picking up a pav bhaji and coffee from the food stall, we moved towards the playwright session which was just going to begin. It was also very interesting. Then moved towards the book section where the books of many eminent writers were displayed for sale. Met some interesting people from book publishing and magazine publishing world. Also spent some time listening to the experience of First Book Club authors like Varun Agarwal, Adithya Mukherjee, and Lavanya Sankaran. Before leaving, we also attended a session where a lively Kannada Sahithya discussion was going on by eminent authors. Anywhere you turn there you would be thrilled to see the literature enthusiasts either reading or scribbling something, or listening to some active discussion- all immersed in the world of literature. It was really a wonderful experience. 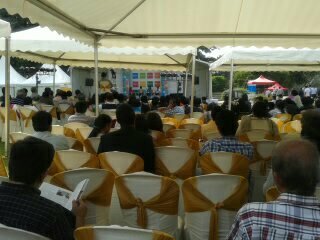 Thanks for sharing with us your experience in "Bangalore Literature Festival". It would have been immensly interesting to interact with people related to the World of books. Do continue to share with us such info. about literature and books. Wish you lot of success with your own newly published book! Thanks Pushpa for reading the article and commenting. Hope more people will be able to attend such literature festivals in future. Thank you for your good wishes for my new book. Your article transported me to the session! Thank you Pankaja for your comments. I'm glad to know that my article transported you to the session. 36 touring the world and exploring it is a true fun. This blog has shared the experience of exploring the Bangalore and its literary society. It is really informative and provides a good quality and useful information.